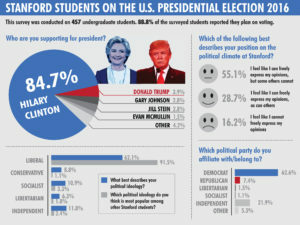 A recent poll of 457 students by The Stanford Daily shows that Stanford undergraduates, 63 percent of whom identify as Democrats, heavily favor Hillary Clinton for president. Only 4 percent supported Donald Trump. However, the poll found greater diversity in students’ general political stances. In the face of a 63-percent liberal majority, students ranged across the political spectrum in terms of ideology. Independents came in second at 12 percent, followed by socialists at 11 percent, conservatives at 9 percent and libertarians at 6.3 percent. The poll had a margin of error of plus-or-minus 5 percent. Nevertheless, students and campus groups of differing political affiliations have found common ground even amidst a heated election by encouraging civic engagement and political discussion. Over 90 percent of undergraduates recently surveyed indicated that they believed Stanford to be a mostly liberal campus, while 62 percent identified themselves as having mostly liberal views. Conservative students interviewed in person characterized themselves as more moderate on social issues than the average Republican, though their beliefs in other areas are inconsistent with those of the Democratic Party’s. However, the survey results seem to indicate that there are more non-liberal students than some students perceived, though they may be less outspoken about their beliefs. Despite the perceived liberal atmosphere on campus, conservative students interviewed by The Daily said that they feel comfortable voicing their political opinions among most, although not all, of their peers. This is a sentiment echoed among other students on campus, as 84 percent of students polled indicated that they felt comfortable with expressing their beliefs on campus. However, 16 percent of students said they did not feel as if they could freely express their opinions and 55 percent said that while they personally could, some others could not. Ultimately, even though the political parties play an important role in filtering the platforms of candidates, civic engagement is about discourse between individuals, according to political science professor Rob Reich. With days left until Election Day, Stanford student groups and administrators alike are ramping up their efforts to encourage political engagement among students. Most recently, Stanford in Government (SIG) released a video featuring prominent figures on campus telling students to “go Card, go vote,” regardless of political affiliation. While Stanford as an institution remains apolitical, students have had to carefully consider their political stances as they fill out their ballots to make educated decisions on numerous high-impact issues, including the presidential race but also local initiatives and down-ballot races. Boosting voter registration and raising awareness on voting issues has been the goal of several on-campus organizations — both partisan and nonpartisan. In addition to its “Get Out the Vote” video, SIG has partnered with the Stanford Voter Project to increase voter registration on campus by registering students at dining halls and community events. To educate students and encourage conversation across ideological lines, the Stanford College Republicans, the Stanford Conservative Society and Stanford Democrats have also partnered to hold debate viewing parties as well a mock presidential debate. According to Stanford Democrats’ Rosen, student political groups have a common goal of ensuring that students of all political affiliations are able to both express and involve themselves. Groups have been jointly hosting events to create spaces for students to debate those who may not agree with their points of view, Rosen said. Contact Cindy Kuang at ckuang ‘at’ stanford.edu and Jonathan Seymour at seymourj ‘at’ stanford.edu.